Frank Thomson was a 37 year old wharf labourer, married with four children, with his son Leslie being the eldest. The family history is that ‘Frank joined up so he could look after his son [iii] enlisting two months later than Leslie in June 1916. Both father and son were first listed as part of the roll of the New Zealand Rifle Brigade and were shipped at different times to the Western Front. Leslie was the first to arrive at the front being posted to the 1st Battalion of the 3rd New Zealand Rifle Brigade 4 November 1916. 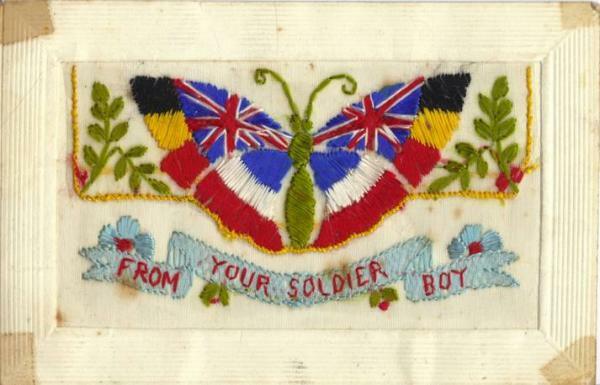 [v] The Somme Battle was drawing to a close at this time but regardless the Western Front conditions would have been a shock to the young soldier. With a major Allied push planned for April 1917 the tunnels had been pushed out from the cavern system and mines had been laid under the German trenches with other tunnels driven to positions just short of the German trenches. This was so that following the explosion of the mines, troops could rapidly break through to the surface and storm the German positions. Following Messines the Allied forces prepared for the Third Battle of Ypres launched on 31 July 1917. Passchendaele was the initial objective and the name of this village has become synonymous with the horrors of the Western Front. Frank was wounded on 10 October 1917 prior to the New Zealand Division’s first assaults. He was evacuated with gunshot wounds (GSW) to the lower forearm first to a field hospital in France and then to then New Zealand Hospital at Brockhenhurst, UK. Leslie with the New Zealand Rifle Brigade was involved in Passchendaele when on 12 October 1917 New Zealand was to suffer its blackest day, in terms of lives lost in a single day. In the assault there were 2700 New Zealand casualties, of which 45 officers and 800 men were either dead or lying mortally wounded between the lines. The New Zealand Division was relieved by Canadian forces on 18 October 1917. Following the New Zealand Division moving to the rear of the front Leslie was given two weeks leave in the UK, he may have been able to see his father in hospital before rejoining his unit again at Passchendaele being involved in Polderhoek operations. Leslie was promoted to Lance Corporal in December 1917 and a full Corporal in January 1918. At this stage he would have been 18 years old. 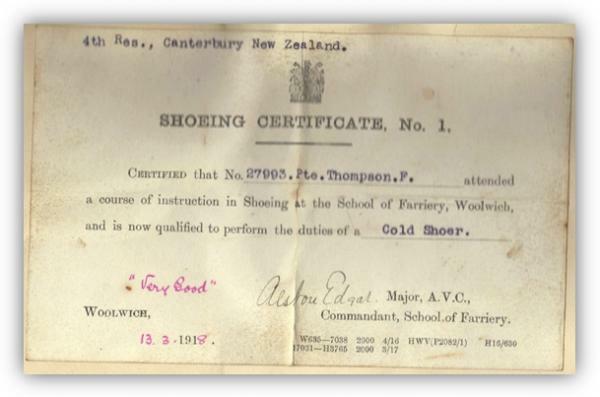 Frank following his release from hospital remained in the reserve battalion in the UK and during this time attended a course to learn the skill of cold shoeing a horse. In March 1918 the Germans launched Operation Michael, their last major offensive. This initially was successful and the Allied Forces were pushed back and all reserve battalions were sent to France. 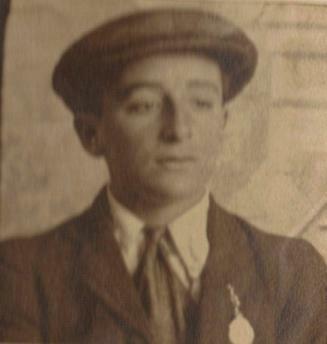 Frank rejoined the Canterbury Regiment in April 1918 but was evacuated sick later June this time with bronchitis and varicose veins. By late April 1918 Germany’s Operation Michael had been brought to a standstill on both the Somme and Lys fronts. There were a series of small actions to straighten and strengthen the positions held by the NZ forces. This was the beginning of the advance to victory. During this interval spent on the defensive, Allied Forces took every opportunity to rest and train and while their strength and efficiency were being restored, to execute with ever increasing frequency and scope, such minor operations that would maintain the fighting spirit of the troops, and at the same time effect local improvements in the line in readiness for the day when the Allied Armies could once more attack in strength. During this time Leslie was promoted to Lance Sergeant, 17 June 1918. One such minor operation, carried by the New Zealand Rifle Brigade on 15 July 1918, was east and south-east of Hebuterne by the 1st and 4th Battalions of the NZRB. The attack was on the Fusilier Trench, which ran roughly parallel to the front line. The attack was a success with the advanced battalion headquarters signalling, at zero hour plus twelve minutes, that we “Have secured our objective” soon after the whole of the Fusilier Trench was in our hands. In the subsidiary operations on the morning of the 16th, our casualties numbered three killed and ten wounded. Two machine-guns were captured and twenty of the enemy killed. One of these would have been Lance/Sergeant Leslie (Les) Thomson. This early memorial was erected, possibly by his father given the inclusion of In Loving Memory. Photograph has been taken in the European winter possibly 1918 – 1919. 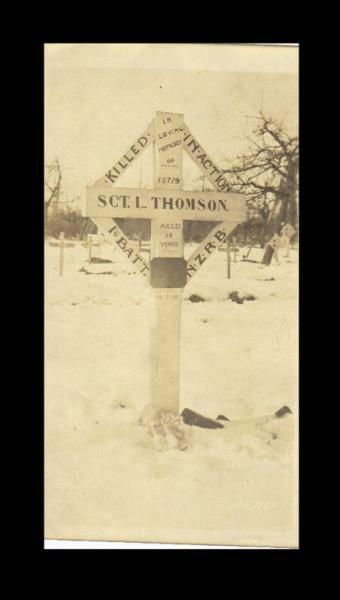 L/Sergeant Leslie (Les) Thomson is buried in the Hebuterne Military Cemetery, in France, Grave I.L.7. The original grave marker has been replaced by the standard New Zealand marble war grave marker when the Commonwealth War Graves Commission consolidated the cemetery in the 1920’s. There are a total of 53 New Zealanders buried in this cemetery. On the back of a duplicate 1917 photograph of Leslie and a comrade are two newspaper clippings from the Evening Post, 2 August 1918. Frank remained with the Canterbury Regiment and returned to New Zealand in 1919. He was discharged as no longer fit for service and returned to Plimmerton, his wife and his three remaining children. 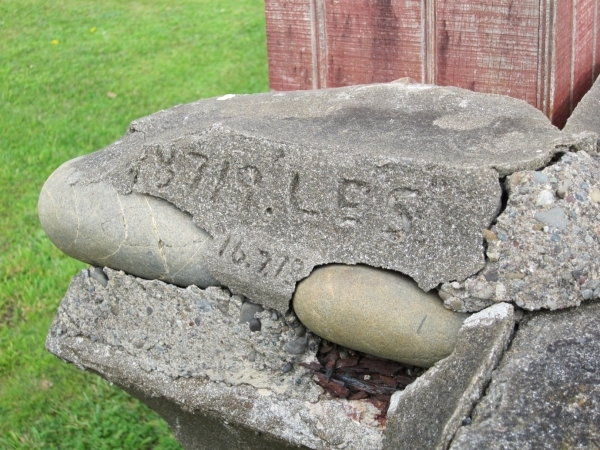 Frank remembered his son by inscribing his regimental number, his name and date of death on a number of stone walls and paths that he built around the family home in Plimmerton. The last remaining inscription is on the front wall close to the letterbox as a lasting memory of this story of a father’s wishes to protect his son fighting on the other side of the world. NZ Archives; service records Frank and Leslie Thomson. NZ Archives; service records Frank Thomson #27993New Zealand Online – The Passchendaele Offensive. A bit of a lad. 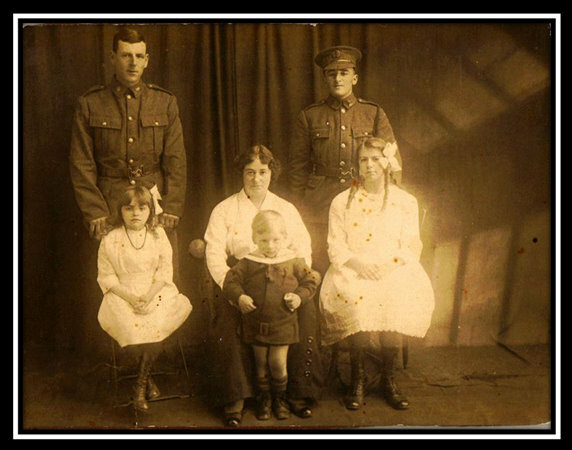 Episode two of the story of the Thomson family and a father and son going off to World War I. Here we find out a little more about Leslie the son. Leslie, the first of Frank and Maggie’s four children, was born in 1899 in Aden Cottage, Clyde Quay, Wellington. After leaving school, Leslie was appointed to a sales assistant’s position with CM Banks, a wholesale and retail stationer with special interest in commercial and law documents, based in Gray Street. CM Banks also had a printing works in Thorndon Quay. When Leslie enlisted in 1916, he was 10 days short of his seventeenth birthday. Leslie pictured with George, a close family friend, while on leave prior to departure for service in France. [v] Note Leslie’s fatiques and casual stance compared to George’s more formal attire and pose. Leslie was docked one day’s pay for being late back from leave. 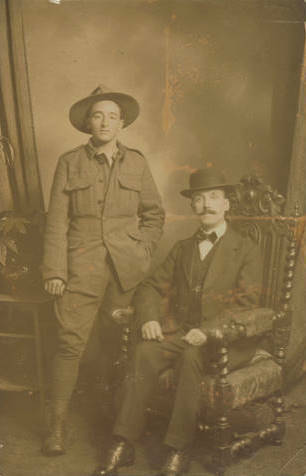 To compare Leslie is in dress uniform when the Thomson family was photographed in July 1916 before Leslie, followed by Frank shortly after, left New Zealand for service in France. See earlier story above. In France Leslie took the opportunity, as all soldiers did, to enjoy his leave away from the horrors of the front. He had a photograph taken with a comrade that he sent back to his mother in Plimmerton. 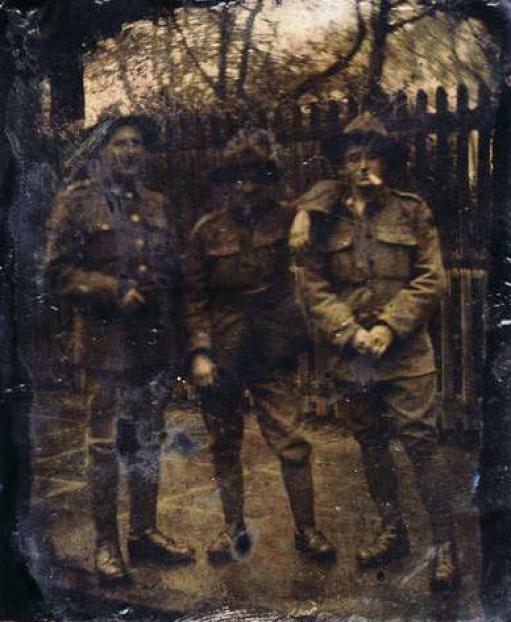 (See Frank & Leslie Thomson story above)Below is another informal photograph of Leslie and comrades on leave behind the lines in France. The original photograph is interesting in that it is a tinplate, an out dated from of taking photographs. The relaxed nature of the group is seen by their stance, and that Leslie is photographed with a cigarette and in casual fatigues. 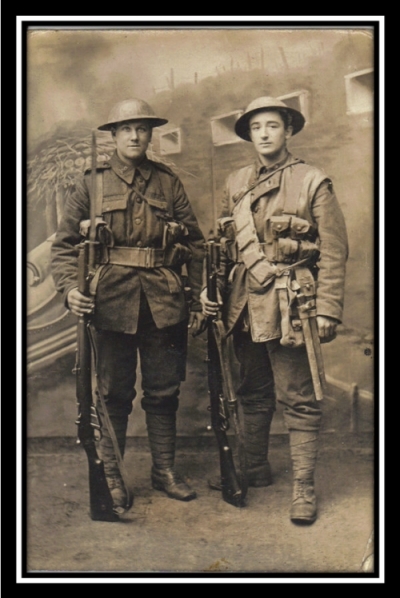 It is possible the soldier on the left is the same comrade as that in the posed photo in the story of Frank and Leslie Thomson. Leslie Thomson was selected as a machine gunner (a key element for defense and attack in the trench warfare of the Western Front). It is possible that as an NCO and leader of a machinegun team, Leslie Thomson would have been a prime sniper target. The family’s oral history is Leslie died from a gunshot wound to the head. [i] A bit of a lad – a lively or dashing young man or youth; The Free Dictionary. Used by the Thomson family to describe Leslie. [ix] Papers Past, Evening Post 2 August 1918. [x] Papers Past, Evening Post 3 August 1918, Roll of Honour.